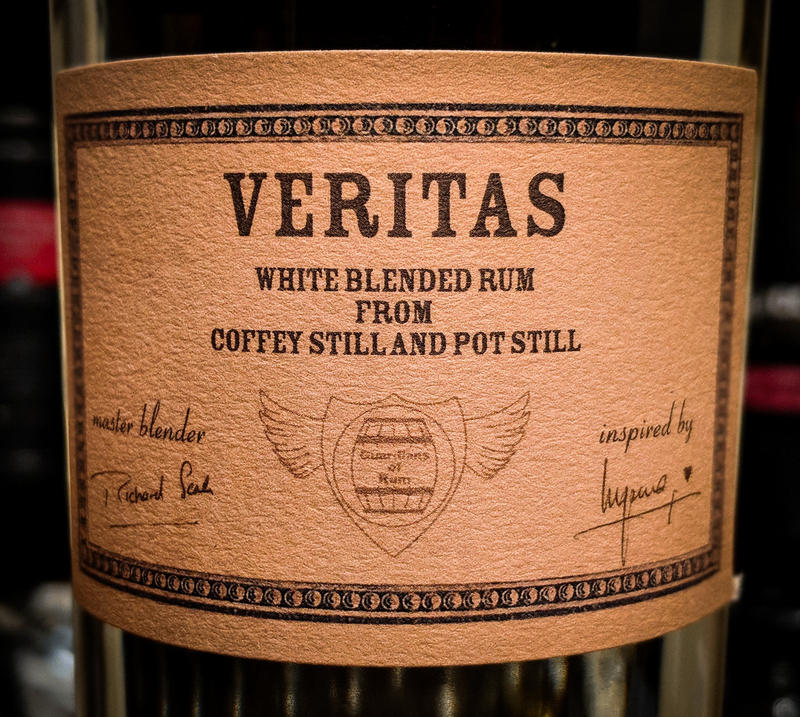 The only way that you won’t have heard about Veritas (Probitas when released in the States) would be if you had absolutely no interest in the Rum world. A teaming up of two amazing and honest distilleries to produce a pot and column blended ‘White’ Rum. These two powerhouses are of course Foursquare Rum Distillery in Barbados and Hampden Estate in Jamaica. The front label, resplendent with a “Guardians of Rum” crest, states that it is a blend of Coffey Still and Pot Still Rums…..it also states the Master Blender (Richard Seale) and the inspiration (Luca Gargano). As you would expect, the rear label confirms that the Coffey Still component is from Foursquare and the Pot Still component is from Hampden…..the rear label also confirms that the Rum is aimed at the cocktail market…..but its so much more than that simple. 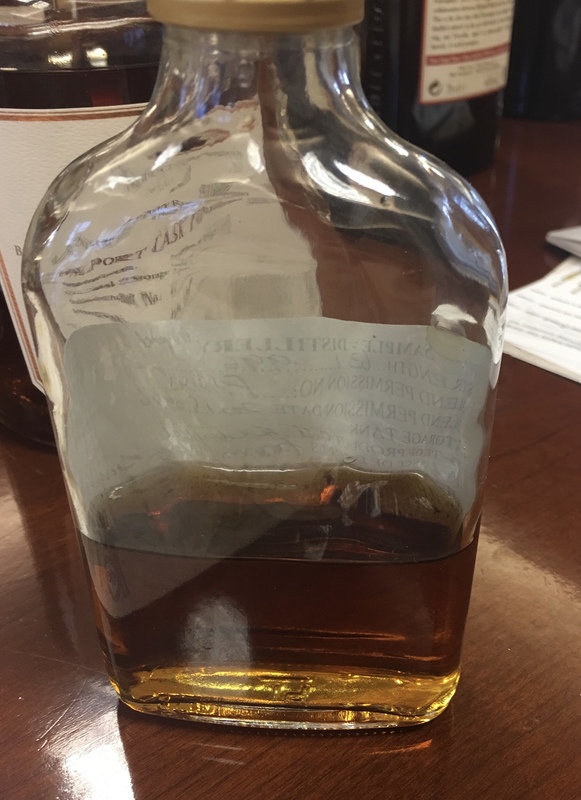 There is also a ‘tongue in cheek’ mention of dosage on the label….I’ll say no more about that….but the jibe would fall flat if the Rum did not stand up to closer inspection. I have written extensively about Foursquare Distillery products and you can read more here, with a bit of information on Hampden Distillery here. I mention above that this Rum is more than it appears on the surface….and here is why. 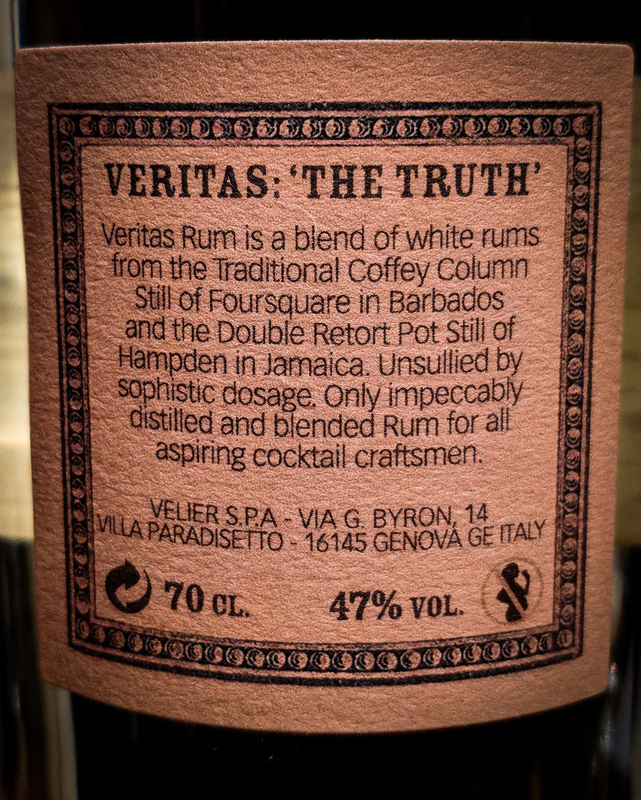 The make up of Veritas is more interesting than stated as it is actually a blend of three Rums. The first component is a 2 year Tropically aged Foursquare Pot still Rum (the Rum has colour for a reason). The second component is an unaged Coffey Column still Rum from Foursquare. The third component is an unaged Pot still Rum from Hampden Estate. There is no charcoal filtration of the Rum. The biggest component of the blend is the unaged Coffey Column Rum which when tasted really does show that a little pot still can go a long way. Digging deeper, the Hampden marque used is OWH (Owen W Hussey). Numbers wise, this is the lowest count marque that Hampden produce….but as has been pointed out to me, purely elevating ethyl acetate isn’t improving the Rum. The OWH marque, whilst ‘low ester’ in relation to Rum, is actually high by spirit standards. The marque itself was put forward by Vivian Wisdom, Master Distiller at Hampden (and all round lovely chap) for use in the blend and its inclusion was agreed by Richard Seale. Nose: Beautifully creamy. The abv excerpts itself robustly on the nose with a little sting. Portuguese custard tarts. Vanilla pods. 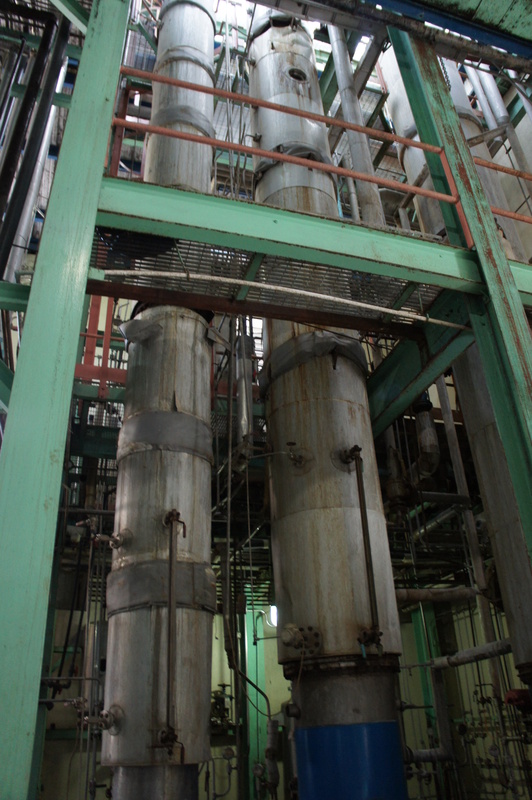 Present but light and very well-integrated pot still element. It possesses the creaminess and fresh vegetal cane like quality of the Habitation Velier Foursquare 2013 and 2015 releases. Light acetone bite dragging citrus oils and a basket of fresh tropical fruit on the table at breakfast in summer. Mouth: There it is. The pot still is way more present in the mouth feel which is a lot more oily than I expected. Real proper weight in this rum on the palate. It is the pot still that leads the early exchanges. Chewy Molasses. A touch of Kola Nut. Give it time and the lighter, fruitier elements come to the fore. Sugarcane. Light and so so typical marshmallow from the Coffey column. Banana. Guava jam on a buttery crumpet. Croissant like buttery pastry sweetness. Molasses in the finish. So much body to it. Really really impressive. Prepare to have your preconceptions of young, cocktail oriented rum changed for good. It’s not just good for a young Rum, it’s good full stop. Yes…..I’d be perfectly happy drinking this neat….but it mixes so well. Daiquiris…good….provided you keep them on the sour side this Rum sings a wonderful tune. Banana daiquiris…..good. It even mixes well with coke. Veritas is around £25 a bottle….you’ll have to buy from a France or Italy at the moment which is annoying…but it’s worth the effort. What we have today is another independent bottling, this time of a Foursquare Rum. 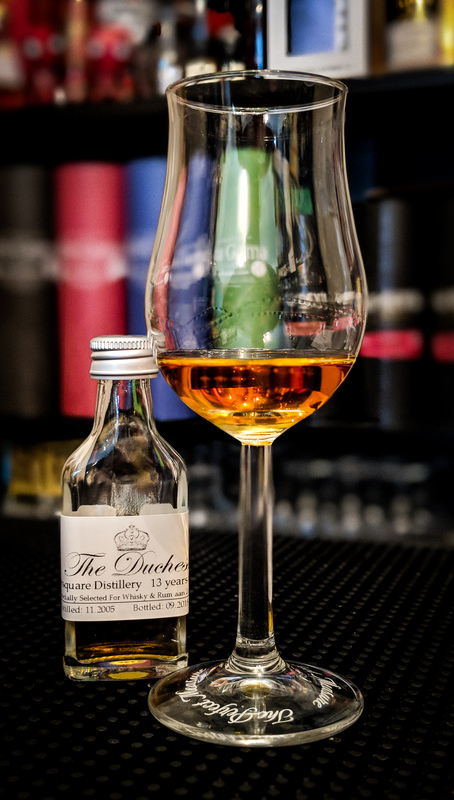 The Duchess is a specialist independent bottler of whisky and rum that they say are to cater for a “discerning audience”. All Rums released by The Duchess are additive and colourant free. They claim to sell an honest Rum for an honest price. I have their Guadeloupe 19 release and can say with all honesty that it is a very good bottling…..so I’m looking forward to digging into this offering. You can do a search on these pages for Foursquare Distillery if you need some background, there are plenty of articles to choose from. 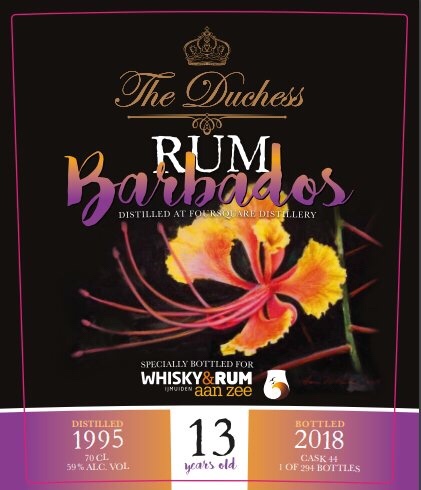 This Duchess Barbados 13 Single Blended Rum release was distilled at Foursquare Rum Distillery in 2005. It saw 3 years maturation at Foursquare before being matured for a further 10 years in Europe prior bottling at 59% abv. It is a run of 294 bottles from cask number 44. The labels on all Duchess bottlings are by Hans Dillesse who is renowned for his work on various Whisky labels. It depicts the National Flower of Barbados whose Latin name is Caesalpinia pulcherrima. It is also known as The Pride of Barbados. The Rum was a joint selection between Richard Blesgraaf and Nils van Rijn for the Whisky & Rum aan Zee Festival 2018 which will take place in the Netherlands this October. I received a small sample of this release ahead of schedule and as a result have already placed my order. Nose: Straight off the rum is bouncing from the glass. A classic Foursquare nose. Oak. Vanilla. Candied fruit peel. A little coconut. There’s plenty of acetone like aromas in there but they’re not dominant. The fruit is joined by some pretty obvious flamed oily orange peel and a bag full of nuts. Dried tropical fruit, maybe some guava juice. Fruit and nut milk chocolate. Freshly shelled peanuts. It is very reminiscent of the nose on the Rum Sixty Six Cask Strength. Wood glue. Sappy cedar wood. Mouth: A very warming and astringent oak led entry. An all-encompassing mouthfeel. Mild sweetness straight off but the oak rapidly comes into play in the early stages. Subsequent visits to the glass reveal a little more sweetness. A bag of dried tropical fruit. Peanuts. Cocoa. Peach loop sweets. Vanilla. Coconut. The mid palate is where the oak excerpts it’s dominance. It brings a host of light spices and plenty of black pepper heat. Seeded bread sticks. Cedar wood. Cumin seeds. The finish, which is decidedly long is initially heavily spiced and full of peppery oak, drying, warming and with real depth. As it progresses it lightens with burnt orange oils, nuts and those oh so familiar peach vapours that I adore. Mild tobacco notes and a hint of mint. It’s always well-balanced, always poised. It lacks the intensity that the rum Sixty Six Cask Strength possesses, possibly a maturation location thing, but my word it’s an impressive Rum. I’ve tried a fair few independent offerings of Foursquare Rum, some have been better than others, but this one gets it all right. It will set you back around €75 and it’s worth every penny. It can be purchased here, and I’d suggest that you do as it’s a limited run. This post has a certain air of inevitability. 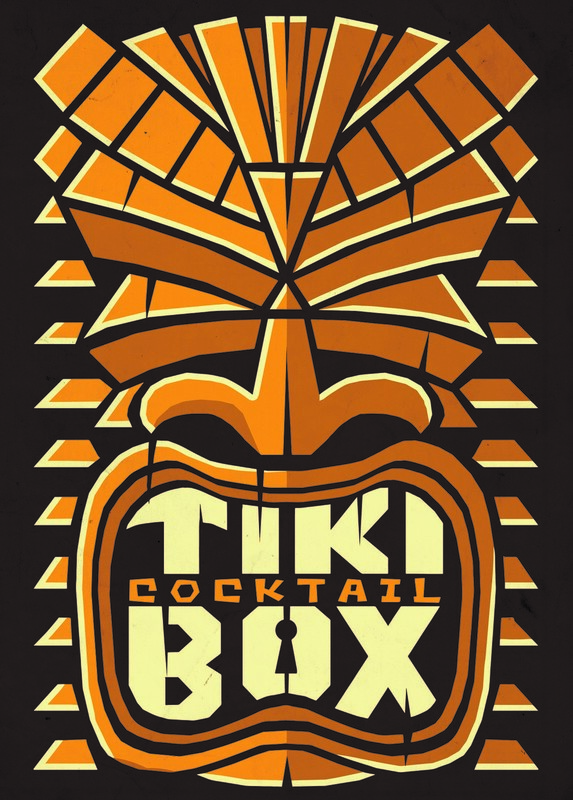 I was always going to try my best to obtain a bottle of this Rum in one guise or another…. As quite a few of my Foursquare articles have started recently, let me take you back to March 2017 in Barbados. Monday’s are not famed for being great days….but this one as you’ll see was very different. It was mid-afternoon on Monday 27th March and we were stupidly late for our rendezvous with Richard and Gayle at Foursquare Distillery. Traffic wasn’t great, and we had stopped off to grab a Roti and a refreshing drink on the way to Foursquare….when I say we, I am talking about Me, my wife Barnali and our friends Ivar and Mariangela. We toured the distillery again (our second time on this trip), with Richard being kind enough to take us around again…..We tasted fresh from the still Rum, Ivar climbed to the top of the Coffey Still enclosure and we got up close and personal with the barrel houses whilst watching the new one being constructed in front of us. The smell of those places, the aroma of Rum, the barrels stacked in their different positions, labelled to keep full track of their location and contents, the sunlight shining through the cracks in the building and highlighting the dust particles in the air……Experiences like that cannot be truly conveyed to others fully. You have to experience it. It’s an assault on the senses and a real heart skipper when I think back and look at my photographs….again. But to Richard and the guys busy beavering around and getting on with their tasks, this is just another working day. It’s almost as if they’ve been doing it for over 300 years in Barbados….. Allow me if you will….again….to take you to the Foursquare Distillery tasting room come boardroom and its bountiful contents. Ivar had just been given his wings (in the Guardians of Rum sense) and we were trying Triptych and Principia. 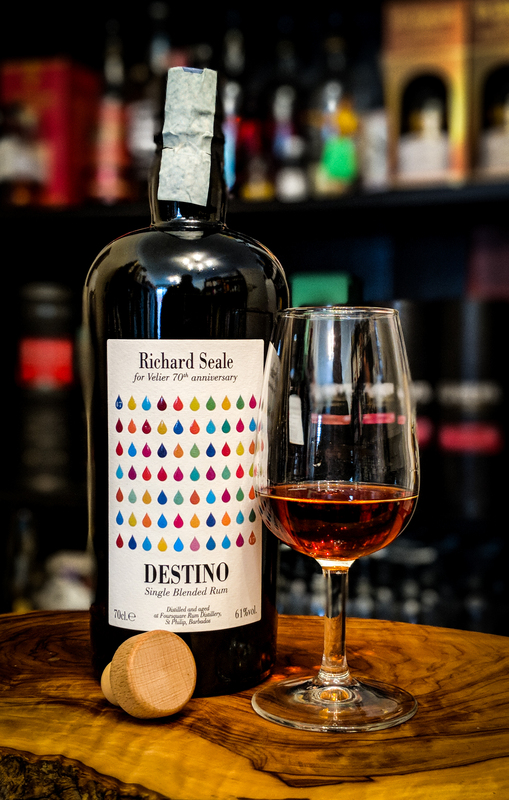 Then Richard disappears for a second and brings back a 200ml labelled flask……’this is Destino’ we were told……..It found its way into our glasses…..
Short and sweet I know, but I was taken aback. This was an experience of a lifetime. Flash forward almost 10 months and a friend and avid reader of the site was able to secure me a bottle of the Velier 70th Anniversary Edition Destino at retail price…..and sold it to me for zero profit. 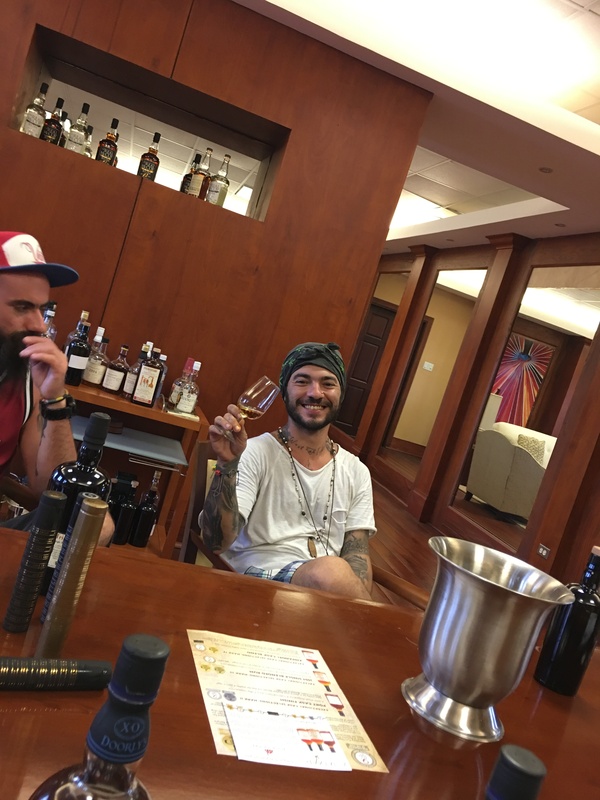 That is what a large percentage of Rum obsessives are like…..they don’t want to hoard and sell….they want to share experiences and help others share experiences. Destino translates from Spanish as “Destiny or Fate”……perhaps it was Richards destiny that he would produce something like this? 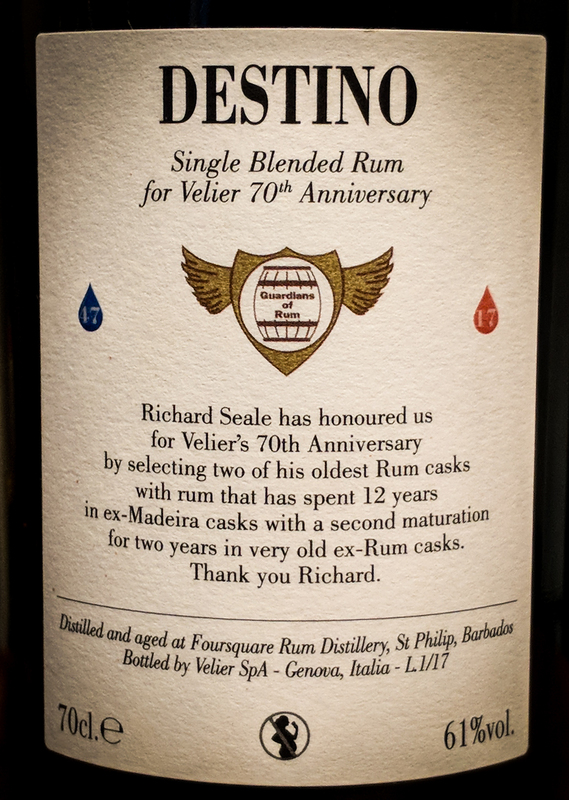 Now the anniversary edition, apart from being a release of 600 bottles taken from two barrels was as a response to Luca wanting Foursquare to make an old Rum for the Velier 70th Anniversary. Richard not being one for cliches and anniversary bottlings agreed to have a differently labelled small quantity run of Destino. Everyone is a winner. As you can see above, the abv did change from the 62% that we tried. This Rum is a Single Blended Rum…a blend of pot and traditional coffey column still Rum. 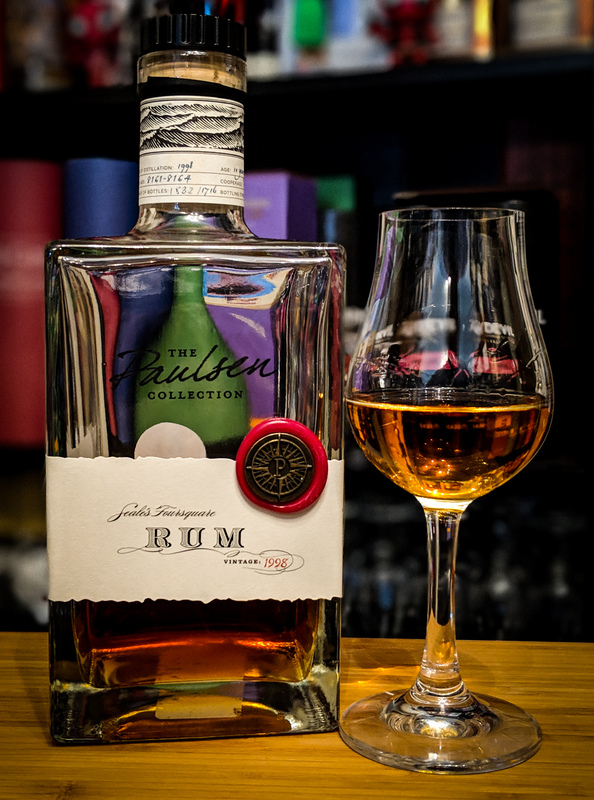 A minimum of 14 years old, this release has seen a full 12 years tropical maturation in ex-Madeira barrels and a further 2 years in barrels that have previously been used for the maturation of Rum……so a ‘Rum finished Rum’ if you will…..though as we know….Foursquare Distillery don’t do finishes…..its double maturation. So, how does this Rum taste? Did Foursquare Distillery manage to keep track of the barrels, move their position and stop them from leaking for just long enough to fluke a win? Glass: The Rum is a completely irrelevant (colour is not our guide) deep, dark bronze. Quite oily and clingy when swirled, the Rum also has an olive-green halo where it contacts the glass. The slightest tingle of alcohol vapour disappears in an instant and the Rum jumps from the glass and into the room. A beautifully focused and robust oak arrives first, a deep dark brooding oak with a tinge of bitterness. Pencil shavings and the heady aromas of the rummy oak from the aforementioned trip around the barrel houses. A hint of acetone. Stone fruit…plump ripe blackberries, blackcurrants and a little acidity. Light and non intrusive vanilla is accompanied by dark chocolate notes. A little tannic, but never distractingly so. It’s a very giving Rum that delivers with confidence. Wet corrugated cardboard. Manuka honey. More dark, powdery cocoa. Dusty books. Walnuts. Nothing is rushed here. Time has played its part and the resultant Rum is a joy to sit with. It’s quite difficult to not dig right in, but you’ll be missing out on so much by not giving it time, uncovered, in the glass. It raises a wide smile when considering just how approachable this robust and punchy Rum is. Mouth: The initial sip is an explosion of juicy hedgerow berries. You’d also never peg this as 61%, such is the level of integration that the alcohol has. There is a sharp bite of gooseberry followed by the rich buttery base of a homemade cheesecake. 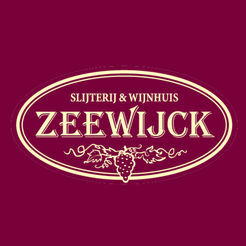 The mouthfeel is such that your palate is dominated by homemade blackcurant and raspberry jam….dark stewed fruit. It’s incredibly rich. Victoria plum freshness is backed by the sticky bitterness of dried prunes that helps to announce the almost sweet and juicy oaken notes on the mid-palate. This soft, chewy oak dries in a wave over the sides of your tongue and brings a pleasing bitter note. This clears the way for toasted coconut, rich velvety dark chocolate and vanilla. The bitterness that fleets in and out is reminiscent of so many long aged Velier Demeraras. The long, rich finish starts with the nip of tart fruit and homemade jam before the drying oak brings salted liquorice, molasses and buttered chewy malt loaf. You’re left with a beautiful interplay of dark stewed fruit and oak that you can almost chew. Right at the back-end there’s something floral and almost perfumed before the trademark apricot vapours announce themselves. You just have to pour more….which is why I’m halfway down the bottle. 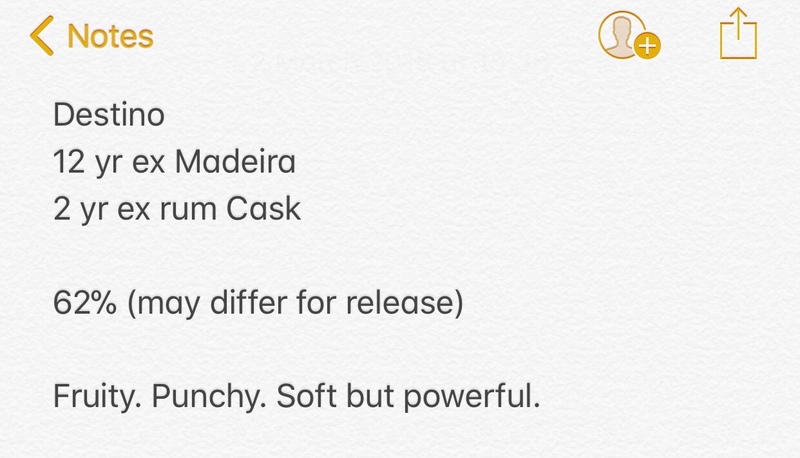 This Rum is so much better than a 5…….But 5 is all that I have to numerically display my appreciation…..perhaps the below can expand on this number…. So there we have it. This is seriously impressive stuff. A real kicking up of gears for Foursquare and a foray into new territory as this may be their oldest Rum matured fully in their own facility….and it is without a shadow of a doubt the best Rum that Foursquare Distillery has produced to date. It just has so much going on. I’m still discovering new things to write about even as I’m wrapping up this review. It has layers of complexity that unfold in front of you. Depth beyond anything they’ve produced previously. The bar that I said Principia had set, has once again been raised. Destino is bottled proof that if you know what you’re doing you can produce something honestly, with integrity and grace that flattens all in its path. There is no quick fix…this is knowledge and good old fashioned time. 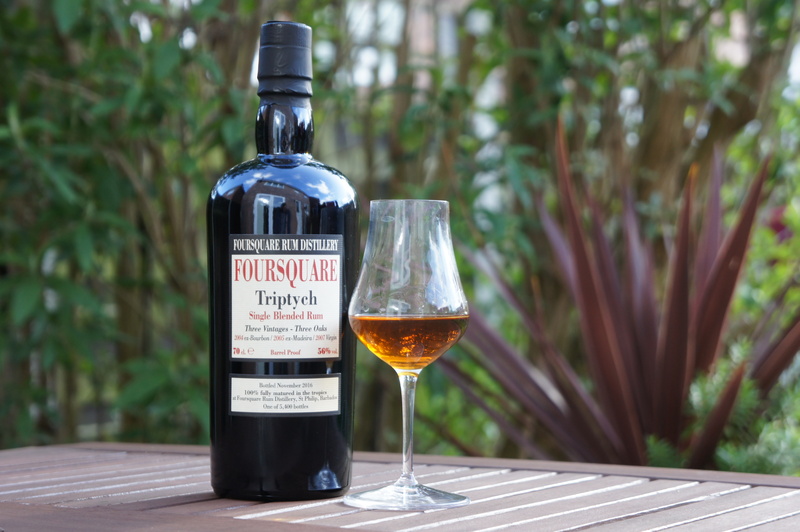 Foursquare has its production methods rooted firmly in the tradition of the 300 odd years of Rum making on the island of Barbados that preceded it, but their techniques are refined to a point where this kind of stuff is becoming effortless for the distillery. This is a legacy Rum. Now I’ve not been fortunate enough to obtain a bottle of Principia yet…..I do however have a generous friend that visited an even more generous distillery owner in late December and I now have about 25-30ml of Principia to bring you my initial thoughts. 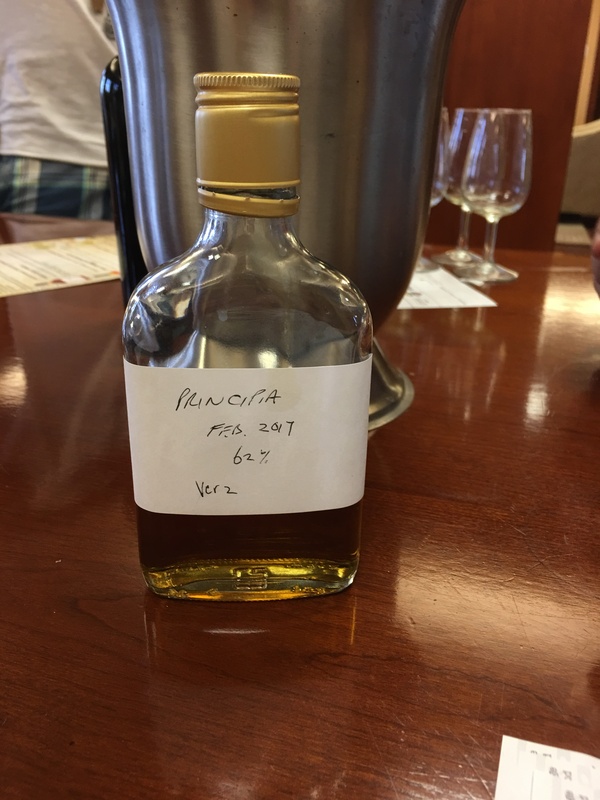 We were fortunate enough to first try Principia when we visited Foursquare Distillery in March 2017 and were instantly blown away. We then had another chance to try it over two days at the UK RumFest in October 2017 and were further impressed. Now it has been bottled and I assume shipped over to Velier in Italy, we can hopefully look to obtain a few of the available 5400 bottles. 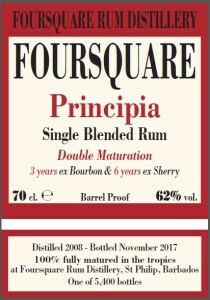 Principia is another result of Foursquares ‘double maturation’. It is a Single Blended Rum that has seen 3 years in ex-bourbon barrels and then 6 years in very old Oloroso barrels. No ‘finishes’ here. It’s quite standard for Foursquare to use Oloroso barrels but its their double maturation technique and the length of time that they are left to mature in those differing barrels that Foursquare do so well. It’s all just so well judged and must have taken a hell of a lot of foresight given the list of upcoming releases from the distillery. So without further ado…..
Glass: The colour is dark burnt amber. Oily citrus bursts out of the glass. A very apparent oak. Pencil shavings. Spice and black pepper. The oak is the backbone dragging with it deep dark stone fruit. As noted on my very first tasting back in March 2017, this is very full but so soft and approachable. A bag of mixed fruit and hazelnuts. Burnt toffee and the mildest hint of milk chocolate. Mouth: It sings on initial entry. Its all that you want it to be. A classically crafted Foursquare sweetness gently wraps itself around your tongue bringing with it its robust but surprisingly soft sherried wood. Don’t think sherry as in the massive taste of sherry….its no hybrid abomination…far from it. Very old Oloroso barrels have been used and its the seasoned quality of the wood that is being sought, not necessarily heavy sherry influence. A jar of homemade blackberry and raspberry jam and the tartness of Ikea Lingonberry preserve. It has real grip as the oak begins to dominate the mid-palate….but its never aggressive…in fact quite the opposite. Its moisture sapping yet fruity and the alcohol is so well-integrated in the grand scheme of things that you would never guess this was 62%…2006 shows its heft way more than this. Tannic and peppery with plums, dried prunes and hazelnuts. It has a persistent oak led finish that grows in heat and dryness. Dried fruit and nuts abound. Even the empty glass is a delight to smell. 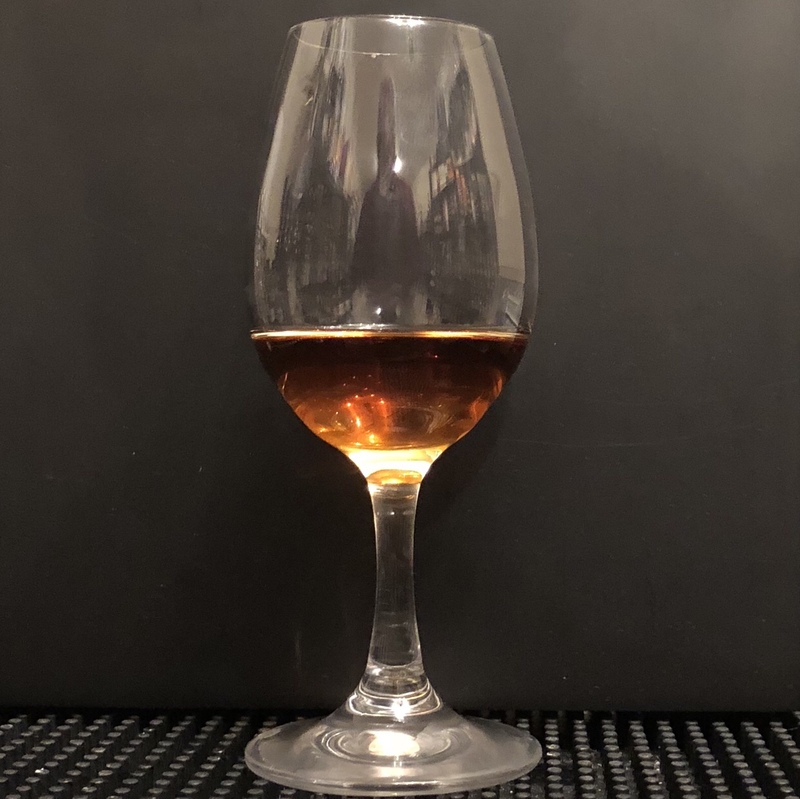 To be revisited, initial impression score………..
Yep….Its maybe the best, most complete Single Blended Rum that I’ve tried to date…though I think that Destino may offer up some resistance. To be honest, Richard has taken Single Blended Rum production and innovation to a point now where he’s only competing with himself. It’s a competition between Foursquare Distillery releases to see which can be the best one…..and that changes with every subsequent raising of the bar. For now, that mantle falls to Principia…its the real deal. I’d hate to think what street value my bottle of Triptych has at the time of compiling this article. 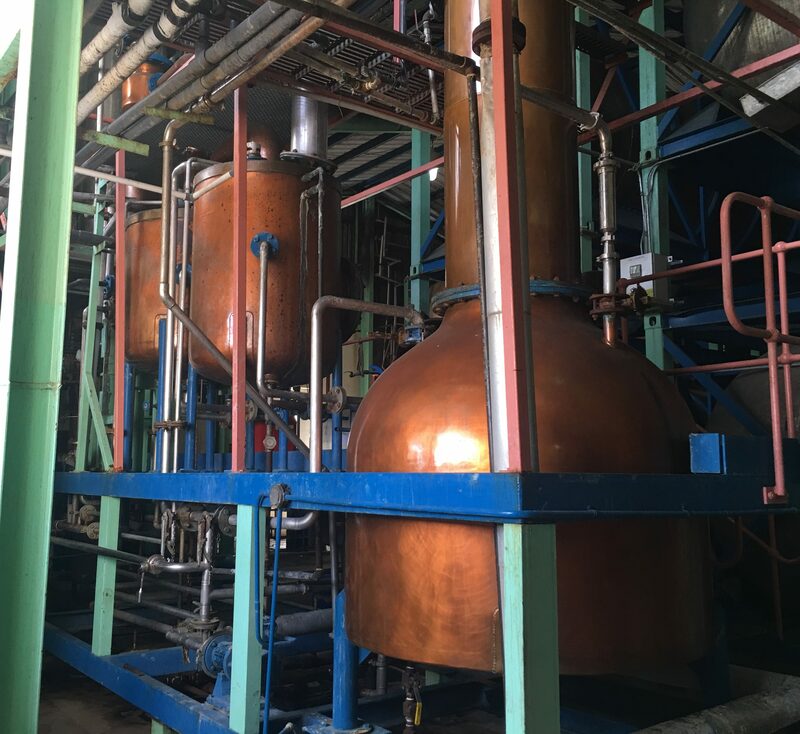 I am recently back from an astonishing visit to Barbados and my first visit to a Caribbean Rum Distillery just had to be a trip to Foursquare……in fact it was so much fun, we did it twice within 10 days. Just the ability to get such a first hand, up close and personal experience was amazing….and best of all…..given the open and honest policy that Foursquare Rum Distillery has (albeit adhering to the ‘no go’ signs which are there for your own safety), you can also experience this. I wholeheartedly suggest that you do. Just to share the room with the stills that produce these Rums is worth the trip alone. But lets just take a moment to look at the glorious black bottle, the striking label and that glass of majestic dark amber liquid…..
My first opportunity to try Triptych came at last years UK RumFest and even with a certain amount of palate fatigue, it was impressive……Now getting to try it again in its actual release blend format, whilst in the Foursquare Rum Distillery tasting room was the thing of dreams. I was sat next to Barnali, right opposite my good friend Nikos and I had Richard to my right. Glasses were duly prepared and Triptych was poured. The next five minutes were spent in silence, nosing the glass and grinning from ear to ear. As far as experiences go, this was by far one of the finest……but Triptych wasn’t the only thing that we got to try that day….and we tried even more when we returned for our second visit with Ivar and Mariangela….On that visit we were also fortunate enough to be joined by Gayle….but had the setting, the excitement of being in the room that I’d only previously seen pictures of, the sun of Barbados and the amazing company influenced my opinion of this Rum? Fortunately I have spent the last 5 weeks or so dipping into my available supply to compile my notes…. You’ll know all about Foursquare Rum Distillery if you’ve been here before and a few of their more recent releases can be found here and here. A little more about this release then. The name gives up a lot….Triptych…..We automatically assume that it has three components. The bottle label details that there are three single blended vintages each with a different oak maturation. A 2004 ex-Bourbon, a 2005 ex-Madeira and a 2007 Virgin Oak. Virgin Oak for me (based on my reading, not on experience) has always been synonymous with Bourbon given its distillation method. Where a distiller can make their cuts with a Pot still or choose a specific plate on a Coffey still, a Single Column still allows the good, the bad and the ugly to pass over into the distillate. Virgin Oak I have read is used as it has an initial aggressive effect on the distillate, calming the rough edges in a short space of time. 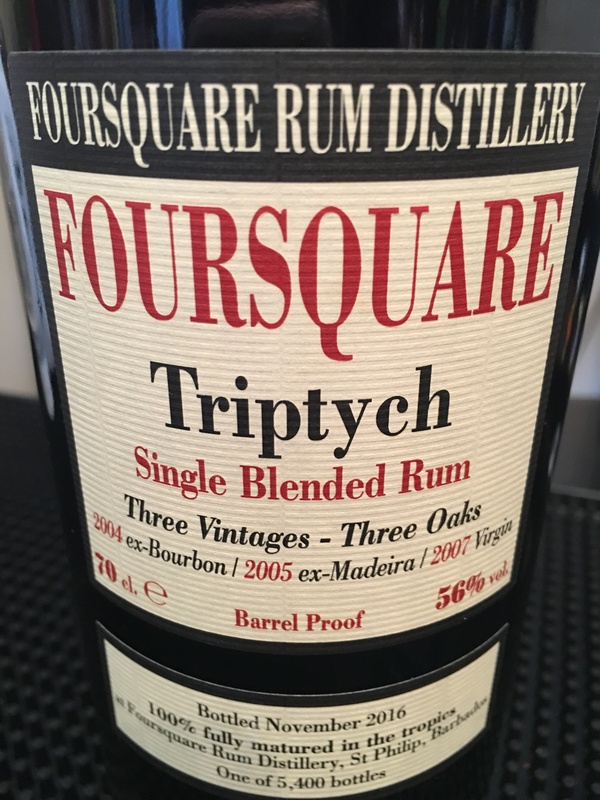 That has always led me to view its use as something that wouldn’t necessarily be used for the maturation of Rum from a Pot Still or Coffey Still…..But this is Foursquare….and they thrive on this type of innovation. I posed a couple of questions to Richard regarding the make up of the blend and the differing barrels. Firstly, this Single Blended Rum is made up of three other Single Blended Rums. I was asked via Instagram whether the blend is a collaboration between Foursquare and Velier. 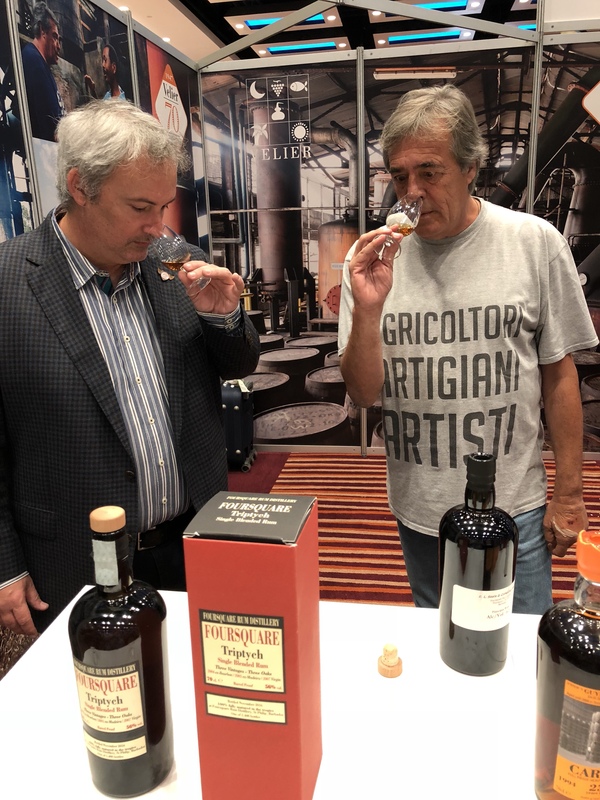 I can report that the blend is entirely developed by Foursquare Rum Distillery, with samples being shared with the Velier Group for their comment and observations. The ex-Bourbon barrels were utilised for the 2004 Single Blended Rum up until bottling in November 2016. The same goes from 2005 for the ex-Madeira barrels. I did however ask a few more questions about the Virgin Oak. Firstly I wondered if the aggressive character of the barrels led to them being monitored more closely than usual during the process and whether Virgin Oak was chosen to accelerate the maturation process over a shorter period…..I received some real insight into the use of these barrels. Virgin Oak requires sufficient air seasoning to allow it to become easier to work with….and the cask choice was perhaps one of necessity. With the reported stock shortages of ex-Bourbon barrels at the time (2007), Foursquare took the opportunity to experiment and familiarise themselves with the more expensive Virgin Oak barrels (Virgin Oak is twice the cost of ex-Bourbon). Monitoring of these barrels occurs more closely due to the aggressive effects of the oak and light blends will typically spend no more than 6 months in new oak. Based on the fact that the blend spent 6 years in Virgin Oak prior to transfer into older barrels for the remainder of its maturation period (approx. 3 years), I asked the obvious follow on question of whether this Single Blended Rum was particularly Pot still heavy to cope with the effects of the Virgin Oak. This was confirmed. An excellent and open insight into the constituents of this super complex Single Blended Rum. 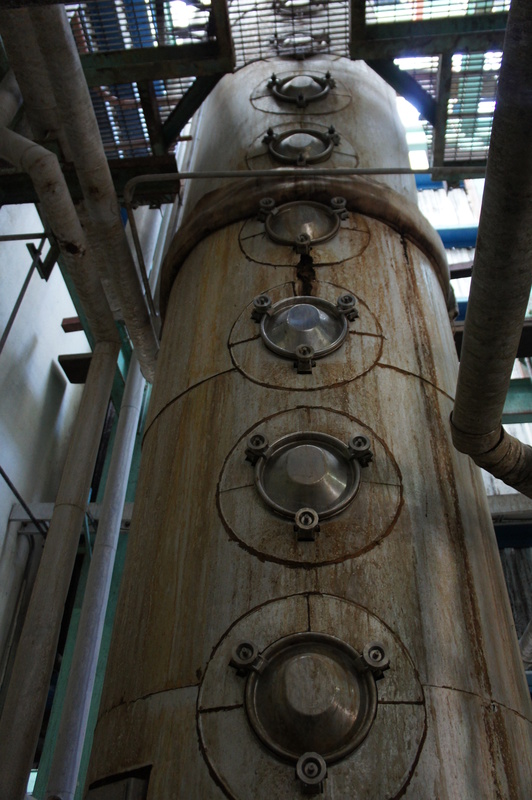 I also managed to grab a few (hundred) photographs on our visits and below are the two stills that created this Rum. Glass: Dark amber with copper flashes. Quite a lot of astringency initially. Heavy stone fruit and the acidity of fresh quince juice. A developing grape influence and acetone. Soft but growing oak. The entire opposite of what I had expected given the presence of long maturation in fresh oak. I braced for dominant oak and vanilla….it did not dominate. Such is the complexity, even the oaken influence seems to introduce itself under a series of sub-headings. Light vanilla, pencil shavings, dusty library books, cherry influence from the ex-bourbon through to damp wood. Toasted coconut, walnuts, milk chocolate and powdery cocoa have an interplay with earthy, dirty aromas and chestnut mushrooms. Light floral notes are also present right at the back end. The nose is so well balanced. Everything just works in its own way. No shoulder barging….very British….just standing in a line waiting its turn. This can’t be a fluke though. It has to be down to exemplary cask management plus a large chunk of just knowing what you’re doing. To achieve such a soft, yet powerful nose delivering an experience that is just a joy using three such different and influential cask types is no mean feat. The nose on the 2006 was beautiful. Direct, robust and holding real depth. The Triptych almost makes it seem ordinary (by Foursquare standards). Its like comparing a three-piece band to an orchestra. Mouth: This is a real experience. Soft enveloping amber liquid that is all encompassing. It has a beautifully velvety mouth-feel. Salty, sweet liquorice and pepper both initially and on the mid-palate. Talking of the mid-palate, the edges of your tongue almost curl as the oak announces its arrival….it takes the wheel for a good few minutes but its not overly dominant. Balance is the overarching feel to Triptych. Dry, tannic fortified wine accompanied by dates. Candied fruit peels. Apricot. Pickled Ginger. Toasted coconut. A definite sappy cedar wood. Floral wildflower honey. Its wave after wave of intense flavour. There is tropical fruit….maybe pineapple and banana. At the back end there is milk chocolate. It is a beautifully savoury / sweet Rum (thats sweet, not sweetened…never confuse the two). The finish is of a medium to long length….a dry oaken start progresses to salty-sweet liquorice and a return of the tannins and stone fruit. Again, characteristic of Bajan Rum for me is the trademark apricot vapour and its here. Each barrel has its moment in the spotlight, tells its own part of the story. Certain elements grab onto certain areas of your tongue, pinging your senses and leading you on a journey. You absolutely could not create this experience using ‘short-cuts’….and thats what it is….its an experience. It takes the near perfect 2006 and just adds layer upon layer of complexity. Its more nuanced. More light, more shade. Sweet but never as sweet as the amazing Zinfandel and Port Cask. Even now, 5 weeks in I’m discovering more. I’ve not even added water….Did I mention just how unlike a 56% spirit this feels? It carries the intensity of a higher abv Rum but its maturity and balance make it a joy to behold. Triptych is the mark of a Master Distiller and a Distillery rooted in tradition, devoted to doing things the right way. Building upon a desire to experiment, re-invigorated by the belief that others have placed in it and reveling in the impact that it is having on the industry and consumers alike. It is entirely on top of its game. Its ‘pulling wheelies’….not to impress….but just because it can. It is also sticking a middle finger up to the ‘Bajan rum is boring’ crowd. I’ve struggled with this over the course of the 5 week period….dwindling my stocks of both Triptych and 2006 in side by side comparisons…..But I can hand on heart say, step aside 2006….there is a new benchmark in town……for now…..The amazing thing is, this wasn’t even the best Rum that I tasted on our visits to Foursquare….